The Briton 1438E.R.SE Silver Push Pad Panic Latch is a rim latch which is operated via push pad, and is able to be utilised on not only single doors, but also the first leaf of double rebated door sets. It can easily be reversed on site even though it is able to be supplied in either left or right configuration. You can either use it with a rim cylinder which is fitted on the outside of the door or with a 1413E OAD (outside access device). 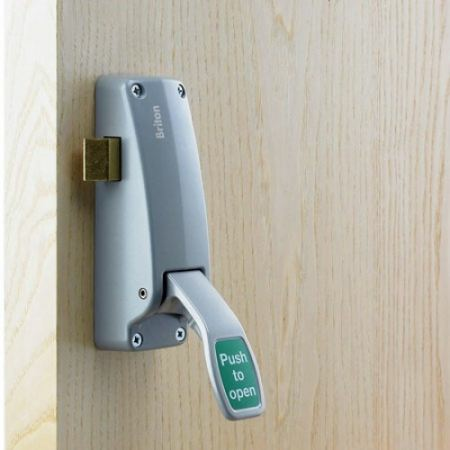 The panic push pads provides immediate exit in the event of an emergency whilst also providing security against unauthorised entry, but with the Briton 1438E.R.SE Silver Push Pad Panic Latch it does not feature locking bolts like other panic hardware products do, ensuring an easy installation.